Leaves look like dandelion leaves, but the rest of the plant is quite different. 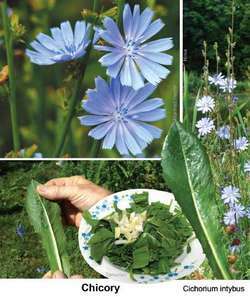 Chicory (sometimes called "wild lettuce") has tall, almost empty stick-like stalks with light bluish purple flowers with thin square-tipped petals. When just starting as greens, the leaves look almost identical to dandelion, except maybe a red vein in the middle. Before this stem grows, you can tell the difference with dandelions by turning a leaf over… if the stem has little white hairs on it, it's not dandelion (which is smooth). The roots are used as a coffee substitute by roasting, grinding and brewing like coffee. The ground up root is a great probiotic food and source of fiber. The whole plant is edible. Diuretic, laxative, sedative, cardio-tonic (good for the heart), lowers blood sugar, used to help heal liver and gallbladder (jaundice, skin problems) Anti-bacterial, anti-inflammatory. Use the greens, buds and flowers in your salad and put the ground up root in your drinks! Mildly bitter earthy flavor. Cichorium intybus. A perennial herb of the order Campanulales grown for its edible green leaves.